Looking for a cool and hip car that is both chic and elegant? Want to get great mileage while still getting the best features of comfort and style? 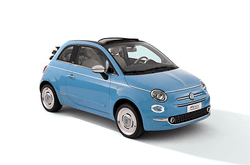 If so then the Fiat 500cc is the compact car for you! All the retro style and city-driving fun of other Fiats but with the sun on your back and the wind in your hair thanks to the convertible top! It features four seat and three doors for compact size fun in the sun all day long! This is fun and classy driving like never before and it can be yours quickly and easily with one reservation. Enjoy great mileage rates, high safety ratings, customized interior features, and much more- act now before this popular model gets booked up and is unavailable!